Are Twin Gear Juicers Really The Best? When you’re shopping for a juicer, it’s easy to get confused about which type is the “best”. Really, they all work well enough to make fresh, healthy juice. But the truth is, some are better than others. Twin gear juicers, also known as triturating juicers, are considered by many people to be the best on the market. If you are serious about juicing, then this article will help you decide if a twin gear juicer is right for you. One of the biggest benefits of this type of juicer is that they are able to tackle almost any raw food you throw down the feed tube! Unlike some masticating and many centrifugal juicers, all twin gear juicers can handle wheatgrass, sprouts and leafy greens. Here you can see a photo of the Samson twin gear juicer that can juice all kinds of fruit and vegetables as well as wheatgrass. 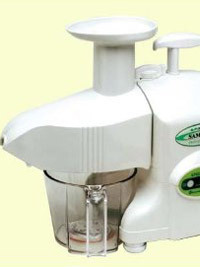 The Greenstar juicer is another quality twin gear juicer. You can use this type of juicers to make a wide variety of other foods as well, such as baby food, pate and more. They will easily grind up nuts for nut butters, so you can make your own fresh almond, cashew or even peanut butter right at home. Twin gears are the most efficient juicers by far. They use two interlocking gears to grind raw fruits and veggies and extract their juices. These gears ensure that more juice is extracted, so you have far less waste than you do with some other juicers. Like masticating juicers, they press the pulp to strain the juice…they just grind finer, and can extract more juice. An important thing to realize about juicers is the higher the RPM’s, the more foam you get in the juice…and that leads to faster oxidation and destruction of beneficial enzymes. These juicers, on the other hand, have the lowest overall RPM’s, so you never have to worry that you’re losing important health benefits. While twin gear juicers are usually more expensive than other types, the higher price tag is well worth it if you are serious about not only making your own fresh juice but your own baby food, nut butter, sorbet, pate and other foods. If all you want to do is make fresh juice for breakfast, you can get away with a much cheaper juicer. Also, clean-up is a little more involved, because there are two gears to clean and they have to be re-aligned properly afterwards. Read more of our juicer reviews, to understand the range of juicers available.